West of Pembroke Dock near Fort Road . A fortification built in 1848-51 to protect - Pembroke Royal Navy Dock Yard . 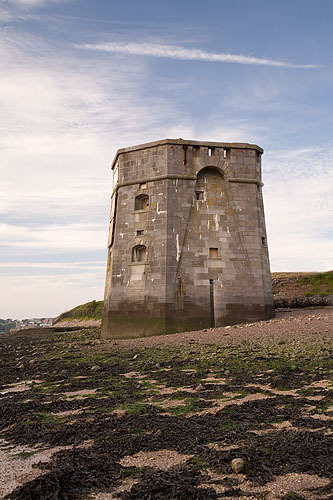 Formed the inner defence of Pembroke dockyard together with the Pater Battery (1842 - demolished 1903 ) and the East Martello tower . One of three Cambridge Gun Towers built in the haven , named after HMS Cambridge the Naval Gunnery School at that time . The fort could hold a Garrison of 24 men . Armaments :- a 32lb smoothbore canon on the roof , 4 bronze - 12 pounder howitzers , 2 on each floor and a rack for 16 rifles on each floor.